We recently returned from an approximately 3 month mission trip to Europe where we ministered, traveled and had divine appointments while the U.S. waged war against it's vicious attackers from September 11. We left only a few days after the attack and the scene we were departing into could not have felt more perilous and uncertain. 0000 Severe warnings against traveling from the U.S. State Department and warnings of terrorist cells all over Europe. Plus, all events in Europe involving Americans being canceled gave us pause. However, the Lord led us on to a spiritual battlefront to preach and minister in the vast mission field of secularized Europe, which is a bigger mission field than most realize. The most recent statistics (US Ctr Wld Msn) show that with only 2.4% evangelical Christians (those who've come to saving faith in Christ) Europe is now the least evangelized continent in the world falling to last place in percentage of Evangelicals. Contrary to popular thought, it is a huge mission field in desperate need of the Gospel. The terrorist attack had direct effects upon our trying to get there. Our original plans had a stopover and airline change in New York. The airline said they would give us a free rerouting due to circumstances. Spiritual warfare hit though when a belligerent employee of Air France pulled us off just as we were about to board, questioning our rerouting and why we should be traveling during such times. He then forced us to pay a large extra fee and said he wouldn't let us on the plane unless we did. We realized that the enemy was just seeking to stop us from our mission . But, God led us to forge ahead and just pay the fee and leave it in His hands to deal with later. Satan often sought to stop Paul from his missions (1Ths. 2:18) and we shouldn't be surprised when we find ourselves at odds with principalities and powers also since our battle is not against flesh and blood. We arrived intact, though with a few less dollars in our pockets than we planned, and went forward in faith to minister in France, Sweden and Norway. 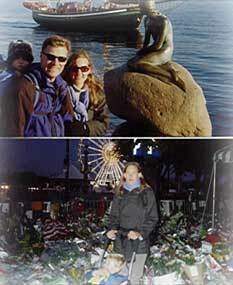 Top: Passing through Denmark, on the way into Sweden, in front of the famous Danish monument The Little Mermaid, like most visitors we said: "Gee, it's much smaller than it looks in the pictures." Bottom: Mercedes in front of a makeshift memorial in Paris to victims of the 9-11 attacks where hundreds of flowers, cards, and American flags were placed. Anthrax letters and fears plagued the States, and in Norway while headway was finally made in the war in Afghanistan. As the bombs began to fall in Afghanistan, the power of the Spirit fell as we ministered in France, preaching in the cities of Lyon and Tours. From the first meeting the Lord moved in power with people being saved and filled with the Spirit . We then realized why we had experienced such spiritual warfare on the way there.